We are always talking about our favorite things to do in Asheville. Asheville’s eclectic vibe is sure to please even those with the pickiest tastes. There is never a shortage of things to do. Asheville will never leave anyone without any plans on a random weekday afternoon or weekend night on the town. Our staff here at Wake is about as eclectic as Asheville’s vibe. Their ideas of fun and relaxation range from sipping on cocktails to watching movies. They sure know how to enjoy all this town has to offer. They do not hesitate to soak up the local vibe when they are not at the shop making guests feel at home. Intrigued yet? Do you want to find out what else Asheville has to offer? Carolyn, one of our fabulous massage therapists, said she enjoys running on the trails. She loves running at the Biltmore Estate and Bent Creek. She also loves visiting Shining Rock for some amazing hiking trails. Ella, another of our fabulous massage therapists, said shopping is one of her favorite things to do. She loves the many unique stores and boutiques on Lexington Avenue. She also likes visiting the Botanical Gardens . Jen, one of our Team Experience leads, said that in the warm weather at dusk, she loves to sit on the Sunset Cocktail Terrace at the Omni Grove Park Inn. There is nothing better than toa soak in the sunset view while sipping on a cocktail. Kelie, another one of our Team Experience leads, said you can find her sipping tea and chilling at Dobra Tea. She also likes watching movies at Asheville Brewing Company. Lindsey, our Director of Guest & Media Relations, said Ecstatic Dance is a one-of-a-kind event where you can let loose and step out of your comfort zone. Lisa, our Director of Team Experience, said one of her favorite ways to exercise is to go for a run on the Mountain to Sea Trail. Natalie, another one of our talented massage therapists, said you can find her groovin’ on a Friday night at the Drum Circle in Pritchard Park. Taylor, one of our beloved Customer Experience specialists, said getting some donuts at Hole is one of her favorite things to do in Asheville. She loves trying out the different restaurants in West Asheville, too. There are endless ways to enjoy the amazing food scene. 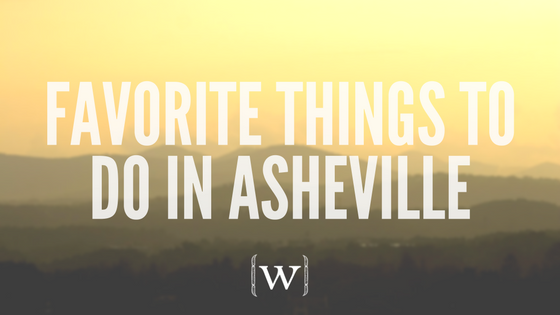 What do you love to do in Asheville? Share some of your favorites–maybe they’ll become our favorites too!